The Wi-Fi-enabled Belkin F7C029FC WeMo Insight Switch monitors your electronics usage so you have a better handle on your utility bill. The Belkin F7C029FC WeMo Insight Switch turns your existing outlet into a Wi-Fi-enabled electricity monitor. Set rules and schedules for different outlets with the free WeMo app, so your lamps go off at the same time every day. You can also monitor your appliances and turn them on or off remotely. Particularly useful for heat-producing appliances like space heaters, hair straighteners, and electric kettles, the Belkin WeMo Insight Switch is also beneficial for making sure your fans and device chargers aren't sucking up energy when you're not home. Energy usage reports generate valuable insights that you can use to reign in your utility bills. The free WeMo app syncs with your Belkin WeMo Insight Switch and tells you how long an appliance has been on, lets you know how much you've spent on electricity for a particular appliance in a given day, and gives you an estimated monthly cost of usage. You can turn the WeMo Insight Switch on or off from anywhere. If you had to leave in a hurry, turn off the A/C window unit from the road. If you're getting in late, turn on all your lamps beforehand, so you don't have to walk into a dark house. In addition to providing usage insight, the smart Belkin WeMo Insight Switch also lets you configure alerts and schedules for recurring events. Cue your electric kettle every morning at the same time, or switch off your television every night at sunset. Installing the switch is quick and easy. Plug the switch into an outlet, plug a device into the switch, and download the free WeMo app to your tablet or smart device. From there, you can start tracking and logging your electricity usage. 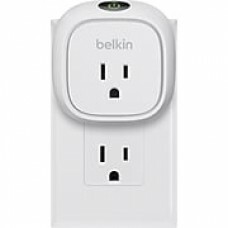 Belkin F7C029FC WeMo Insight Switch and quick install guide.